In this example, I made the top OU called Computer and made several sub OU’s. 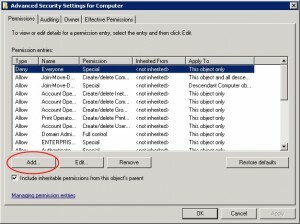 I suggest using an OU because you can apply a GPO at the topmost level to apply specific security to all of your computers. 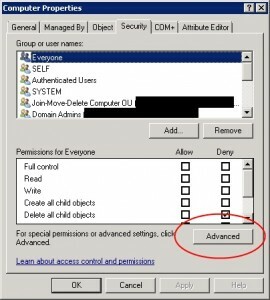 Click the Add button, enter the name of the security group Join-Move-Delete Computer OU and click OK. You can now add any users you desire to this group. 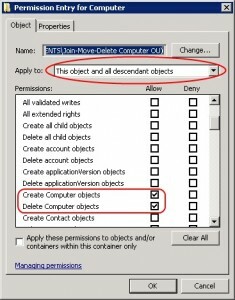 All members of the Join-Move-Delete Computer OU group can now Add and Delete Computers in your domain. 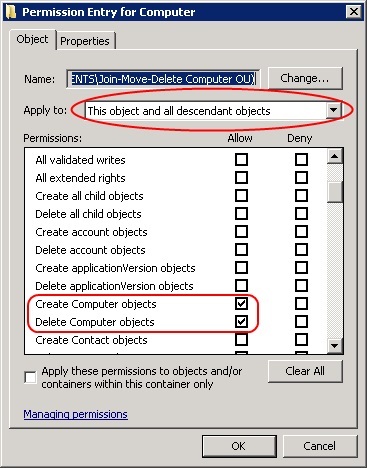 Optionally but likely, you may want your users to be able to move the computers they join to the proper OU. 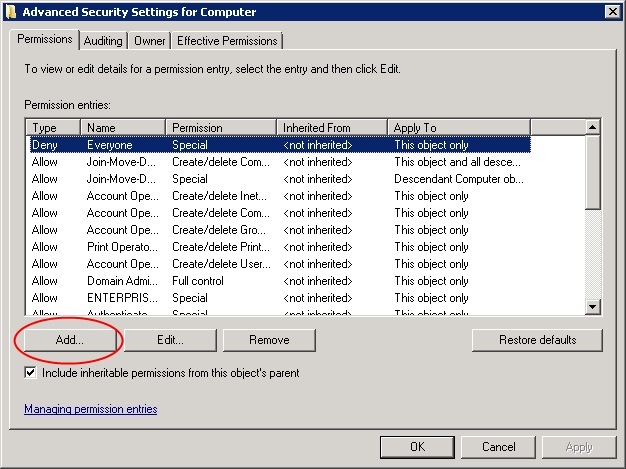 In that case, we need to add 1 more permission. Click the Add button, enter the name of the security group Join-Move-Delete Computer OU and click OK.
All members of the Join-Move-Delete Computer OU group can now move computers between all of the Sub-OU’s in the Computer OU. This entry was posted in Delegation and tagged Delegate, Join Domain, Standard User by admin. Bookmark the permalink. an OU is not a container. it is an OU. Organizational Unit. A CN is a Container.